Two fills, the left one placed on the Keepout layer as an all-layer keepout, the right one placed on the Top Layer, as a layer-specific keepout. A keepout is the name given to an object that blocks or prevents the placement of copper objects within an area. A keepout can be defined as a fence (in essence a wall around the area to be protected), or they can be defined as a solid area of keepout that completely covers the area to be protected. You define a keepout area by placing standard design objects, such as Fills, Tracks, and Regions, to create the required shape. All-layer keepout — place an object, such as a fill, track or region, on the Keepout layer, these objects then create a keepout on all signal layers. Layer-specific keepout — place a layer-specific keepout object on a signal layer, it creates a keepout on just that signal layer. Keepout objects are simply standard design objects, with the Keepout checkbox enabled in the object's properties dialog. Layer-specific keepout objects have the color of that layer, with a thick outline shown in the current keepout color. Layer-specific keepouts are not included in generated outputs, such as Gerber or ODB++. For more information on layer-specific keepouts, refer to the relevant object. 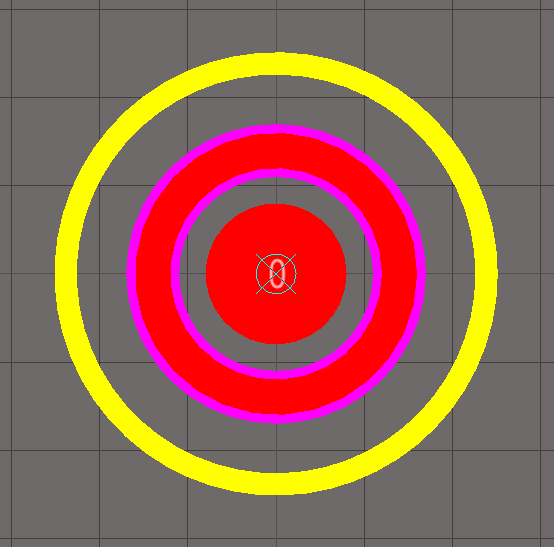 A typical design for a fiducial, the inner red circle is a top layer pad, the surrounding red & purple circle is a Keepout arc. Layer-specific keepouts are not included in generated outputs, such as Gerber or ODB++. If you arrived on this page after pressing F1 over the Home | Place | More Ribbon button in the PCB Library editor, press F1 over a specific command instead.